Have you ever felt the razor-sharp glare of PMS shooting out of your eyeballs and directed straight towards your partner, who you’re sure you want to break up with right that instant? Or the co-worker or friend who just can’t seem to get it together? For myself and many women, it happens every month like clockwork, just before my period. So instead of breaking up (or worse) there are steps you can take to channel this powerful and potentially destructive energy. If you’ve ever heard of the Indian Goddess Kali, you’ll understand what I mean about the danger of keeping the energy of pre-menstruation unchecked! That’s why I’d like to share my favourite Moon Goddess secret to channel the power and potential of the pre-menstrual energy. Let the Enchantress guide you out of PMS chaos and into balance. Instead of trying to push away that not-so-good feeling and tell yourself it’s all in your head, stop to listen and pay attention. You see the reason we generally feel at odds premenstrually it’s actually our inner Enchantress asking us to look at what’s not working in our lives. When we resist, it shows up as the dreaded PMS. Take out a piece of paper and draw a line down the middle of the page – 1 line horizontally and 1 line vertically (like a cross) so you have 4 quadrants. Personally, I prefer to turn the paper on its side in the landscape orientation so I have more space. What am I ready to change? What am I afraid to change? Start with the quadrant that feels most ripe so the answers flow onto your page. Take your time to fill in your responses. Answer honestly. See if you can list 3 ways you’re ready to change and 3 ways you’re afraid to change in each box. 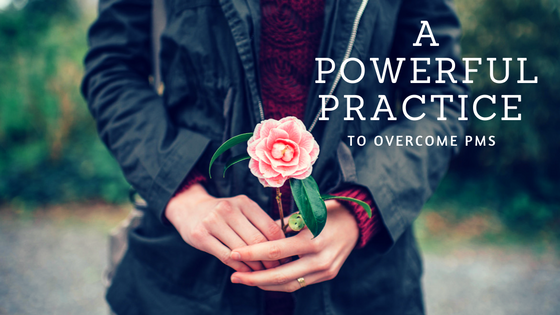 Bonus Practice: Create affirmations to support the change you want to see. When you’re finished writing out all the ways you’re ready to change and all the ways you’re afraid to change, get quiet and read what you’ve written. Then take out a fresh piece of paper or your journal and start writing affirmations to support the changes you’re ready to make and affirmations to reduce the fear where you’re afraid. Going through this exercise is extremely empowering because I’m no longer giving away my power unconsciously to the places that feel ‘out of control’ in my life but I’m taking my power back which is the gift the Enchantress is trying to give me. And remember, You’re not psycho, You’re cyclical. Period. PMS is not a natural part of your cycle, it’s a result of fighting against the flow of your feminine energy. When you resist the natural flow of progesterone to turn inward because you’re fighting to stay in the outward, action-oriented energy of ovulation you will feel like you’re going crazy. Your body needs you to slow down and get in touch with your deepest truths because that’s where your feminine power lies pre-menstrually. So give yourself a break and breathe. Let the Enchantress liberate you from the cycle of PMS. Reflect on what’s not working in your life and support yourself to make the changes you want to see and be. You’ll transform your experience of PMS forever and for the better. P.S. Interested in diving deeper into exploring the four different energies you transition through during the month, and the unique gifts they each bring? My Moon Charting Mastery program teaches you how to ride the ebb and flow of your cycle instead of fighting it. Learn more HERE.